Bright and colourful denim is a nice way to step away from the blue jeans rut while still being just as easy and practical to wear. Stripes go with everything, and in winter it's fun to add a similarly colourful scarf with your bright jeans for easy accessorising. Picking a scarf that matched the skinny jeans is the way I've worn both the outfits below, and while I liked both outfits I had very different days when I wore them. Having a couple of hours kid free to run some errands and go to appointments gave me the chance to get this lovely Balenciaga part time bag out again. I just love the slouch on this bag! I tried a little double denim to meet an instagram style challenge when I wore this earlier in June, but even then it was a little cold and despite the big blanket scarf I wished I'd worn something a little cosier. This was such a nice outfit though, even with the less than ideal denim jacket not keeping me as warm as I'd like. Comfortable, easy to wear, and I had a very productive day when I wore it so it was a winner. Last worn: denim jacket, striped tee, purple blanket scarf, purple skinny jeans, Converse, Balenciaga part time bag. Other ways to wear: denim jacket and maxi dress, striped tee and printed shorts, purple blanket scarf and chambray, purple skinny jeans and graphic tee, Converse and flares, Balenciaga part time bag and striped dress. Perfect for pregnancy: denim jacket and dress in second trimester, striped tee at 40 weeks pregnant, Converse for second trimester travel, Balenciaga part time and little baby bump. I enjoyed the outfit combination above so much that when I was feeling uninspired and not sure what to wear a few weeks later I decided to wear a similar outfit with my red skinny jeans - but with a warmer cardigan this time instead of the denim jacket like in the outfit above. This day started out perfectly with a little lie-in of 10 minutes. It doesn't sound like much, but when you have kids getting an extra 10 minutes to lie in bed before they wake up is amazing! We had a busy morning with a doctor's appointment for Baby Boy and a trip to the pharmacy. When we got home I wasn't feeling the best, and tried to take it easy for the rest of the day. Taking it easy was a good idea as that evening Baby Boy got extremely unwell and we had to call an ambulance. Thankfully we were out of hospital in the early hours of the morning after a few tests, but it's hard to like this outfit as much as the one above when it was such a horrible day when I wore it! I often find I'm harsher on my outfits if I'm not having a good day, even if it would otherwise be something I like wearing. 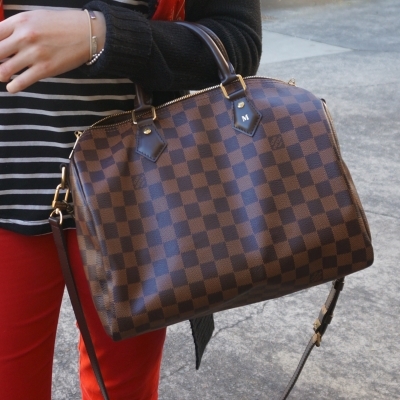 Last worn: black cardigan, stripe tank, Alexander McQueen skull scarf, red skinny jeans, Converse (above), Louis Vuitton damier ebene speedy bandouliere. Other ways to wear: black cardigan and maxi skirt, stripe tank and black skirt, Alexander McQueen skull scarf in summer, red skinny jeans and print mixing, Converse and navy outfit, Louis Vuitton speedy bandouliere and dress. Perfect for pregnancy: black cardigan in first trimester, Alexander McQueen skull scarf in second trimester, red jeans and hidden first trimester bump, Converse in first trimester, speedy bandouliere and maternity pencil skirts. If you're worried that a colourful pair of jeans would be too difficult to style, follow the easy outfit formula of pairing them with neutrals and then a similarly bright accessory. While in winter a scarf that's the same colour as your bright jeans is a good idea, you could make this work in other seasons with a necklace for a similar, more season-appropriate look. And when in doubt, stripes really do go with everything! Linking up with Friday Faves, Shoe & Tell, Mummy Monday, Mix It Monday, Modest Monday, Hello Monday, On Mondays We Link Up, Style Sessions, Confident Twosday. Love how the way styled the coloured jeans, thanks for these ideas dear! Now I wish it was a little chilly where I am so I can wear scarves too! I love those dark purple jeans! That's one color of jeans I don't have but would love to add to my closet! I love, no, I ADORE both of these outfits! I really like the bright colours and how you've made them comfortable for you by adding the scarves. Sorry to hear about all the illness with your dear little one. I associate one of my skirts with one of my old kitties (the chrysanthemum skirt, and old Othello), and I always feel a little sad when I wear it. There can be so many emotions attached to clothes! Took me a while to wear these jeans again. Hi pretty lady!... your scarves and bold colors add a chic and vibrant touch to both looks! As always you accessorized beautifully! Have a wonderful weekend! Oh man your poor little man. It seems like you have been in the hospital with him so many times. I love your bright pops with the scarves and pants! Sadly, we have. Poor bub! The matching jeans and scarves are so cute together! Stripes and sneakers, a perfect combination. And it is nice to see you so "bundled up" for once, finally a style that I can relate to here in my usually way colder country! haha yes our winter weather is much more like your climate! Oh no, poor little guy! I sure hope his health gets better soon, I am so sorry that you have had to go through so much with him. Keeping your family in my prayers Mica! I love both looks--the jeans + scarf coordination makes it so fun! Also--YES to an extra 10 minutes in bed. It can really make a big difference for a tired mama! Thanks so much Shea. He's just not had great luck lately! Such a great color combination. I should buy colorful pants. Oh I love the idea of matching the scarf to the jeans. Both looks work super well and are the perfect go to for day out and about running errands. Great looks! I keep forgetting you're in the middle of winter now ;) Hope your little one is better. 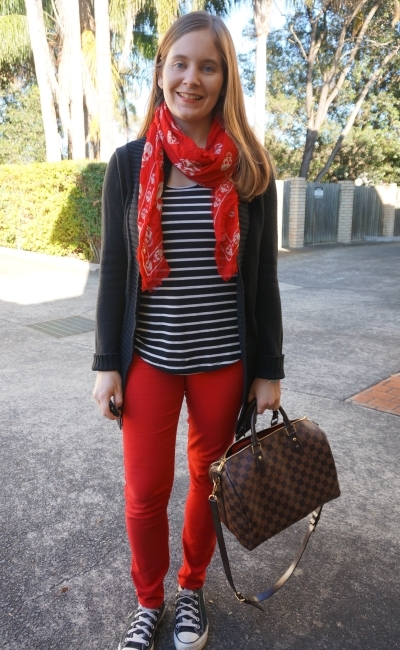 Love the bright scarves and matching pants, and I adore this red and purple ! Great inspiration, and so well done ! Now I can't wait to get out my colored jeans again! I love how you've really drawn out the color of the jeans by adding a matching scarf. These are both easy outfits to wear and put together, but the color really makes them feel more complete and well thought out. It's amazing what color can do for an outfit! Such great tips! I love a bit of colour all year round and I am always a matchy-matchy type of person, so adding a scarf or jewellery the same colour is a great idea! Love how you paired the same color of jeans with the scarves. Will definitely try that with my wardrobe. Always love your style Mica. I absolutely love the red scarf!! I need to be a little more adventurous with my scarves, they are the perfect accessory! Colorful jeans just make winter better! I love this! Ha! what a great idea Mica, matching scarves with the colored denim looks so good. My bright yellow denim was part of my cousin's second hand clothing bag - they were brand new. All I had to do was hem them. So nice of your cousin to give you them, they are great! Your outfits are always so cute!! I am a huge scarf fan...I have a dressmakers mannequin covered in them, lol! Thank you all for your kind comments - baby boy recovered quickly thankfully.